Artworks from Indigenous artists working in some of the remotest parts of this vast continent will be on show in the ‘Clay Stories’ exhibition at Coffs Harbour Regional Gallery from Friday, May 10. The Gallery is one of only six galleries across Australia to host this exhibition of ceramics by established and emerging artists – and the only venue in regional New South Wales. Artworks come from Ernabella Arts from the APY Lands in South Australia, Erub Arts on Darnley Island in the Torres Strait, Girringun Aboriginal Art Centre in Cardwell in the rainforests of Far North Queensland, Hermannsburg Potters from Hermannsburg in the Central Desert and Tiwi Design on Bathurst Island in the Arafura Sea, north of Darwin. 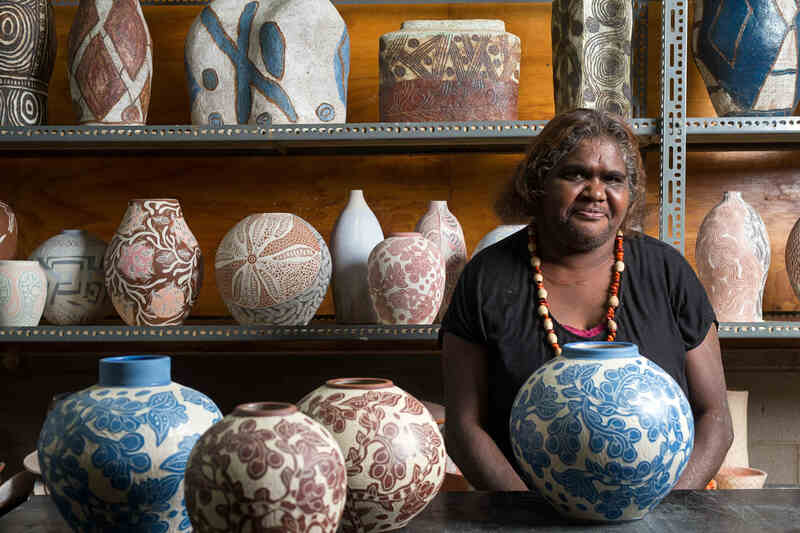 ‘Clay Stories’ is an independent curatorial project developed by Sabbia Gallery, its exhibition curator Anna Grigson, five Indigenous art centres and the Remote Communities Ceramic Network. “This exhibition is a unique opportunity for Coffs Harbour residents to see art from some of the remotest parts of Australia, which are rarely exhibited outside of capital city galleries,” said Jo Besley, Gallery Curator. The exhibition will be officially opened by Bruce Johnson-McLean, Curator of Indigenous Australian Art at QAGOMA (Queensland Art Gallery of Modern Art), with special guests Anna Grigson, Director of Sabbia Gallery, Valerie Keenan, Manager of Girringun Aboriginal Art Centre and Girringun artists Abe Muriata and Nephi Denham. The exhibiting artists include Alison Milyika Carroll, Elizabeth Dunn, Rupert Jack, Lynette Lewis, Carlene Thompson, Derek Jungarrayi Thompson, Thomas Ilytjari Tjilya, Jimmy Kenny Thaiday, Ellarose Savage, Theresa Beeron, Nephi Denham, Philip Denham, Abe Muriata, Emily Murray, Sally Murray, Eileen Tep, Hayley Panangka Coulthard, Judith Pungkarta Inkamala, Rona Panangka Rubuntja, Rahel Kngwarria Ungwanaka, Dawn Ngala Wheeler and Jock Puautjimi.